For any mechanical insulation job, one of the most important decisions is insulation thickness. Especially on a cold surface, where condensation control is one of the main goals, insulation thickness is a key factor that affects performance of the system. It is critical that the designer specify the correct thickness to prevent condensation. Why is controlling condensation so important? Click here to read about the major consequences of condensation control failure. The thickness of the insulation is influenced by the specific application. What does an insulation contractor take into consideration when specifying insulation for a project? The chart below shows which factors are most important to determining insulation thickness when the system is being designed. For many people, preventing energy loss is perceived as a bigger benefit of mechanical insulation than preventing condensation. The insulation thickness requirements in the energy codes of ASHRAE 90.1 and the International Energy Conservation Code do not necessarily prevent condensation. The thickness listed in these codes were set for considering the energy loss and what thickness would be appropriate from a cost/benefit standpoint—not to prevent condensation. The system designer needs to take every facet of the application into account before specifying the right insulation thickness to meet both the project’s energy-saving goals and provide optimum moisture control. Of course, it’s not always possible to prevent condensation 100% of the time, especially in certain environments. 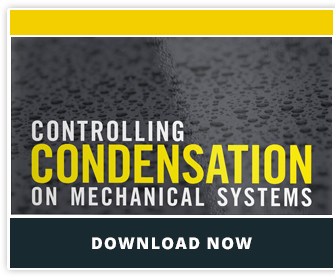 On cold systems that are exposed to outside air with extreme conditions that exceed 90°F and 90% relative humidity for long periods of time (such as mechanical rooms in certain regions), the risk of condensation is significantly increased. In these cases, the system designer’s goal is to calculate the insulation thickness that will prevent condensation for the majority of the time. Overall, thickness is one of the most important factors when determining the effectiveness of condensation control for an insulation system. Specifying the right thickness for each individual application that meets all of the objectives of the project is a critical factor in the system’s success.